APPLAUSE shade: is the most affordable while having all the benefit of weather protection & light control. Available Pleat Size: 3/8" and 3/4". Available Cell construction: Single, Double. SONNETE shade: an innovate hybrid of cellular fabric and roller shade. Sonnette has the largest cellular pleat size of 2"
Honeycomb is the best window treatment for weather protection. Up to 50% of a home heating & cooling energy can be lost thru its windows. Honeycomb shade traps air in distinct pockets to keep your room heating & cooling energy at optimal. If weather protection is NOT your top priority and Interesting Printed Pattern is your #1 choice, then check out Pleated Shade with Bold Color, Exquisite Print. It's also good to know that Pleated Shade is very affordable. Cellular has a shape of a beehive honeycomb. The shade expands & collapses like an accordion. They come in single cell, double cell, triple cell for weather protection & sound absorption. 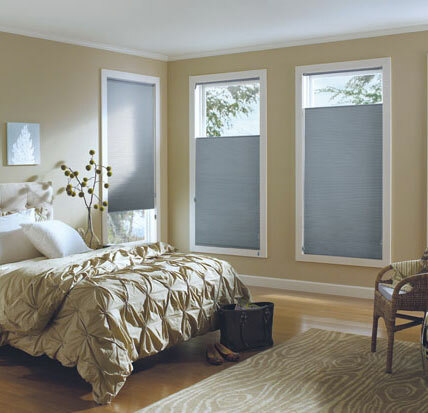 Light Filtering fabric give you privacy while filter the light sun rays so your room has soft light during the day. Great for any room. Room Darkening fabric has a foil layer in between the cell to black out the room (even in daytime) & give you utmost privacy. Great for bedrooms. Top Down Bottom Up is our favorite as it let you control light at any angle. Have privacy yet still see the peekaboo views. Duolite operates like a Top Down Bottom Up, except it has a sheer shade on the top. So you can see more views while still have privacy behind the sheer. Honeycomb is the best window treatment for weather protection. Up to 50% of a home heating & cooling energy can be lost thru its windows. Honeycomb shade traps air in distinct pockets to keep yourr room heating & cooling energy at optimal.